Check out our review of last week's Monday Night RAW, including thoughts Dolph Ziggler, Sami Zayn & Sin Cara vs. Kevin Owens, Stardust and The Miz here. 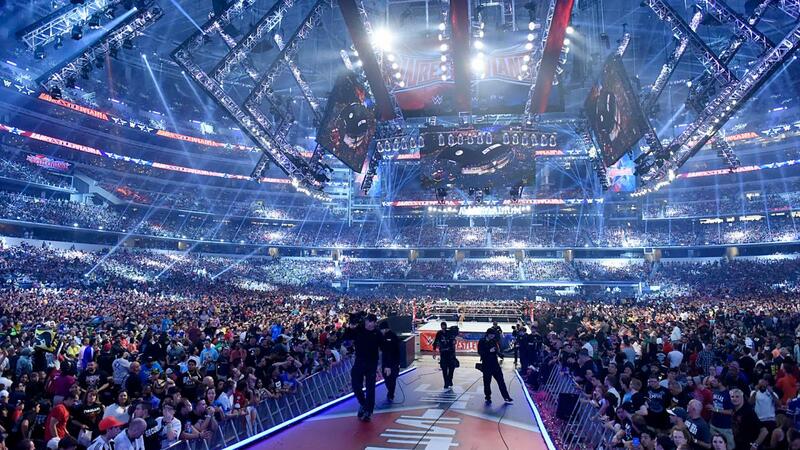 On 3rd April 2016, WWE aired WrestleMania 32 live from AT&T Stadium in Arlington, Texas, USA on PPV and the WWE Network. The Undertaker put his WrestleMania career on the line, as Shane McMahon tried to win control of Monday Night RAW as the pair came face to face inside Hell in a Cell, Roman Reigns challenged for Triple H's WWE World Heavyweight Championship, The Wyatt Family confronted The Rock, before John Cena made his WWE return, Charlotte, Sasha Banks and Becky Lynch competed over the WWE Women's Championship and AJ Styles went toe to toe with Chris Jericho...but was it any good? Let's find out! You can't really go wrong with a big multi-man ladder match, can you? I mean it wasn't the Michelin star meal that a Kevin Owens and Sami Zayn singles bout could have been, but a Big Mac and Fries is still a tasty treat, as well! Lots of thrills and spills throughout what was a pretty well-paced spot-fest that got Arlington nicely warmed up. Zack Ryder's "Elbro Drop", Owens' frog splash onto Zayn on a propped up ladder, Sin Cara getting sent off a ladder to the outside and crashing through Stardust on another ladder across the barricade all stand out as highlights of the bout, but my favourite moment had to be Zayn hitting Owens with a half and half suplex onto a ladder because it looked absolutely brutal. Stardust pulling out a polka dot ladder in tribute to his late father, Dusty Rhodes, was also a great touch. Ladders and Chairs in mid-December 2011! Ryder taking advantage of The Miz's complacentness to grad the belt gave the 30 year old the biggest moment of his career and I have to admit that I had a big smile on my face seeing just how much that moment meant to the Long Island Z. Who the hell knows where this will go from here!? Two supreme talents here, bringing their feud to the biggest stage possible and producing a strong contest. I'm not sure I enjoyed it as much as their match at Fast Lane in February as it didn't seem to have the same depth in the storytelling, but they did put together a number of well-thought out sequences of action. The strongest piece of action in the bout was the build up towards Styles hitting the Styles Clash, which was teased a number of times throughout the bout (from both men) and the build towards it eventually being hit was some of the smoothest activity of the encounter. I'm not upset about Jericho kicking out of the Styles Clash again, especially not to the level of some, although I do feel WWE have missed a trick by not continuing to build the move up to mythical proportions. It would have been a huge moment if this was the first time Styles had hit the move in WWE and even bigger if Jericho had still kicked out! Let's talk about the finish, eh? Styles went for the Phenomenal Forearm and Jericho caught him with the Codebreaker and got the three count, leveling the series of matches at two a piece. It ended up feeling just a little flat to me. The duo had done a similar sequence earlier in the match, with Jericho ducking under Styles before hitting a Codebreaker for a near fall. I had thought that this was a fairly strong false finish that got a decent reaction from Arlington, however seeing it essentially repeated for the finish was a bit of "Meh" moment. I understand Jericho leveling the series, to potentially continue the feud past WrestleMania, but with this being the biggest show of the year, this will end up being the most remembered result of all. A fast-paced six man tag was next as The New Day collided with The League of Nation in a bout that I found a lot of fun. Lots of nice spots scattered throughout a decent length match, that showcased all six men well one their own, I felt like the two groups could have looked more like units to take it too the next level. It did at times feels like six guys all trying to get their to stuff in, but I was still entertained throughout the match. For me, Big E shone the brightest here as his comeback sequence and multiple overhead belly to belly suplex looked great, as did the spot where he spear two of his opponents off the apron. The L.O.N. 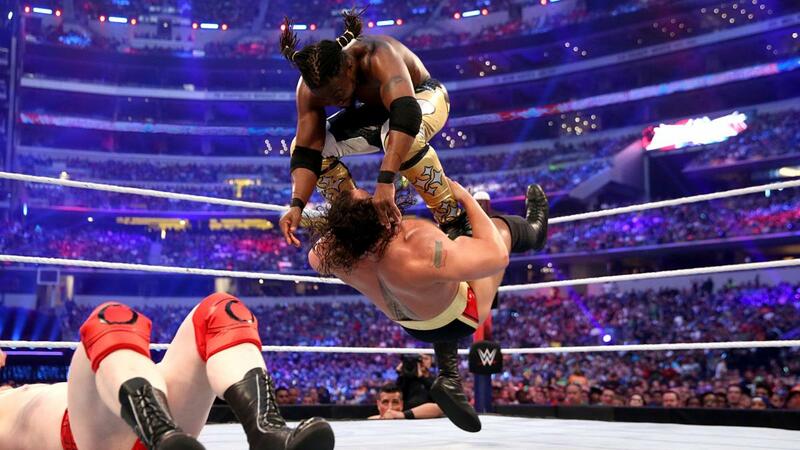 getting the victory was another surprise, with King Barrett interfering to hit Kofi Kingston with a Bullhammer and allowing Sheamus to connect with Brogue Kick, however it made sense with what WWE had planned for us next. Seeing multi-time WWE World Heavyweight Champions Shawn Michaels, Mick Foley and "Stone Cold" Steve Austin coming out and kicking the L.O.N's arses, before drinking a couple of brewskis (or at least smashing them together in the case of Michaels and Foley) was a damn cool moment. Barrett's promo lead into the moment perfectly and the pops from Arlington sounded great on television. The New Day got an opportunity to get involved as well with a bit of a dance, before Austin ceebsed it off and hit Xavier Woods with a stunner. 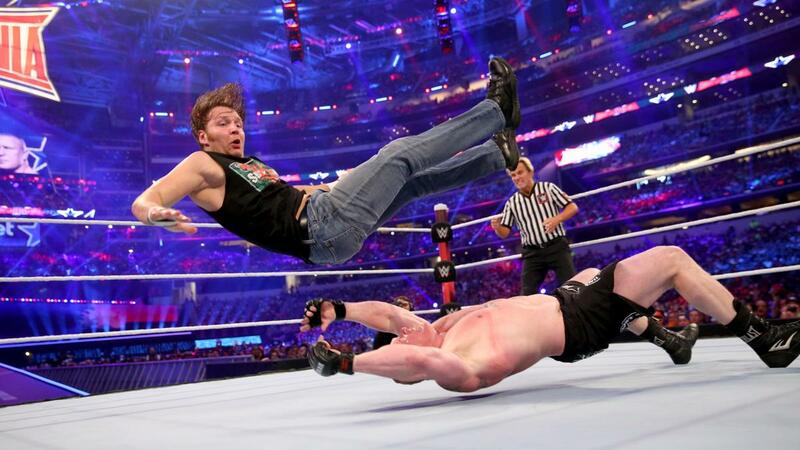 WWE has always been about creating memorable moments and this was definitely one of them! WWE had managed to over-hype this match to high-heaven over the last few weeks and it just couldn't live to the brilliant build and the expectations of many. I mean, it was a good match and there was a lot of quality stuff in here as Lesnar threw Ambrose about the ring and Ambrose put on a brilliant performance, but it just wasn't quite what it felt like it should have been. The introduction of the chainsaw and barbed wire bat through the storyline, and having Ambrose meet with Mick Foley and Terry Funk over recent weeks, meant that I was expecting this bout to take WWE's Street Fight's back to, at least, something approached the level of Foley's bout with Edge at WrestleMania 22. Ambrose didn't even bring out his trailer full of weapons that he filled up on last week's Monday Night RAW! I liked the general structure of the contest, with Ambrose doing anything he could to try to get the better of the bigger and stronger Lesnar, but the duo didn't manage to explore the whole length and depth of what they could have done in the ring and even outside of it. Overall I think the match didn't end up feeling like one of the main events that it was originally promoted as and indeed ended up feeling like one of the bigger undercard matches than anything. I'm sure if you hadn't watched any of the product heading into the bout then this would have been a much more enjoyable contest as there were some pleasing spots throughout. In the end, this was a good match that should have been a great match. 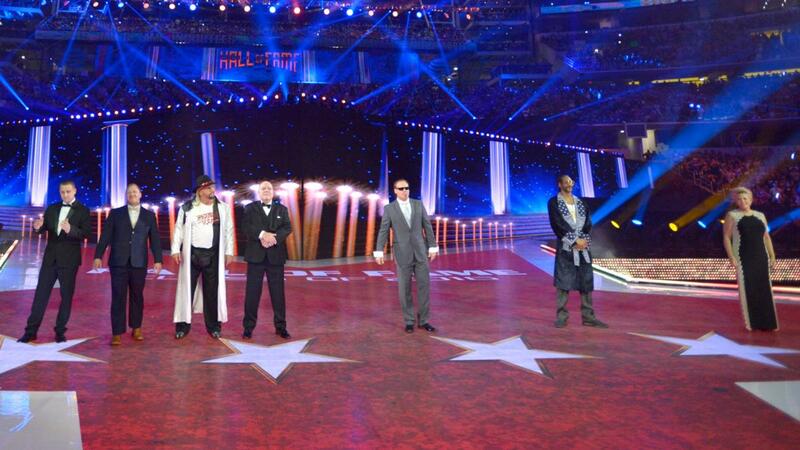 Always a cool moment this, but the HUGE crowd made this even better for me as the WWE Hall of Fame Class of 2016 made their way in front of 101 thousand people in Arlington. Former WWE Intercontinental Champion The Godfather, the family of former World Tag Team Champion The Big Bossman, former 2 time WWE Women's Champion Jacqueline, former 4 time Triple Crown Champion Stan Hansen, The Fabulous Freebirds (represented by former WCW World Tag Team Champion Michael Hayes, Jimmy Garvin, former 2 time Triple Crown Champion Terry Gordy's son Ray and former WCW World Tag Team Champion Buddy Roberts' son Buddy Jr.), Celebrity Inductee rapper and actor Snoop Dogg and Warrior Award recipient journalist, author and television host, Joan Lunden. The moment was crowned off by former 2 time NWA World Heavyweight Champion Sting making only his 2nd WrestleMania appearance, coming out looking pretty damn swagger with the sun-glasses making him look reminiscent of his run with the Main Event Mafia in TNA. Can you imagine even contemplating that a Women's Triple Threat match could even be considered as having stole the show by anyone a few years ago? It would've been an utterly ridiculous statement and if you'd have mentioned it to anyone you'd probably have been laughed out of the building. However, Charlotte, Sasha Banks and Becky Lynch put on the best women's bout in the history of WrestleMania here and completely own their moment in the spotlight. It was made all the better that all three women were over huge with the Arlington crowd, as they cheered loudly for Becky and especially Sasha, whilst pouring scorn on then WWE Diva's Champion Charlotte. I'd like to take a moment to talk about how cool it was to see all three women treated as superstars on the same level as the men as they came out. Sasha coming out to a remixed rendition of her theme song, with a brand new rap from new Hall of Famer and her cousin Snoop Dogg was quality moment and you could see just how much it meant to Sasha to be out there. Sasha wearing tights based on her hero Eddie Guerrero was a cool touch as well. Charlotte looked every inch of the champion she should, coming out in a sweet robe, that according Michael Cole had pieces of her father's robe that he wore at WrestleMania 24. Whilst Becky's entrance was slightly less memorable, the upgraded version her regular entrance was still fun to see on the huge scale. The women put together a brilliant three way bout, with the momentum swinging in numerous ways throughout the contest and trio having some strong moments of wrestling both all together and one on one. The section on the outside of the ring stands as my favourite part of the bout as Sasha ducked under a Becky clothesline to perform a suicide senton on Charlotte, Becky then decided to take out Ric Flair (and finally get some revenge for his sexual assault at Royal Rumble) before Charlotte later put an exclamation point on the whole sequence with a beautiful moonsault to the outside onto both Becky and Sasha. The action built well to the conclusion, with Charlotte acting as spoiler for Sasha breaking up her Banks Statement on Becky and locking in her Figure 8 on the Lass Kicker, whilst Flair made sure Sasha couldn't get involved. Whilst Sasha would have produced a crowd-pleasing moment, with Charlotte being so very over as a heel at the moment, I think making the fans wait just a little bit longer for Sasha to capture the title and keeping them interested in that storyline was the right direction to go in. On a side note, the new WWE Women's Championship belt looks a like a special edition Magnum ice cream. The Undertaker and Shane McMahon just had a 30 minute match in 2016. Think about that phrase for a moment. The Undertaker. Shane McMahon. Undertaker. Shane O'Mac. 30 minutes. Taker. Shane. 30 minutes. 2016. It's April, if that helps you. I'm attempting to send this message back in time to try and make sure that everyone's 100 hundred percent ready for it when the moment comes. Because I'm not sure any body was ready for this, were they? I was convinced that the bout would be choc-full of interference and shenanigans and hijinks and tomfoolery, but that wasn't the case. Whilst the pair didn't exactly "wrestle" for 30 minutes and had a number of gimmicks to help them get to their mark, they were still out their for almost an hour performing in front of the massive crowd. Maybe it was too long for some people, but I found myself really drawn into the action by the strength of the two characters and I think that's what kept me interesting in the action. The Undertaker ran through a series of his greatest hits early doors, as the pair brawled around the structure and built the foundation for what would grow bigger and bigger a the bout went along. A snake-eyes attempt, the leg drop on the apron, a near fall from a Last Ride, all the moves you'd want to see from the Undertaker and especially from the Undertaker at WrestleMania were seen in the opening exchanges of the bout and I think that allowed the crowd to settle into the style of the contest, as Arlington seemed to be completely hooked from start to finish here. This contest was based mostly on moments, and before we get to the biggest one of those I want to talk about why I think this style is the most suitable for an event like WrestleMania. Of course, moments are pretty much what WWE is built on anyway, especially to the casual fan. "Remember when Mick Foley fell off the Cell?" "Remember when Hogan slammed Andre?" "Remember Austin passing out in the Sharpshooter?" There's many more of these as well. Whilst it wasn't nessecarily the most technically nuanced match that you'll see, moments like Undertaker hitting a chokeslam onto the steel steps, McMahon laying in the punches only to locked in Hell's Gate, McMahon's original leap of faith into the metal bin, Undertaker driving Shane through the cell, Undertaker driving Shane O' through the announce table to escape a sleeper hold all made this one a lot of fun for me. My favourite moment came when McMahon was sat up against the Cell and looked up to the heaven, because everyone knew what was about to happen and it just built that expectation for what was about to come even more. 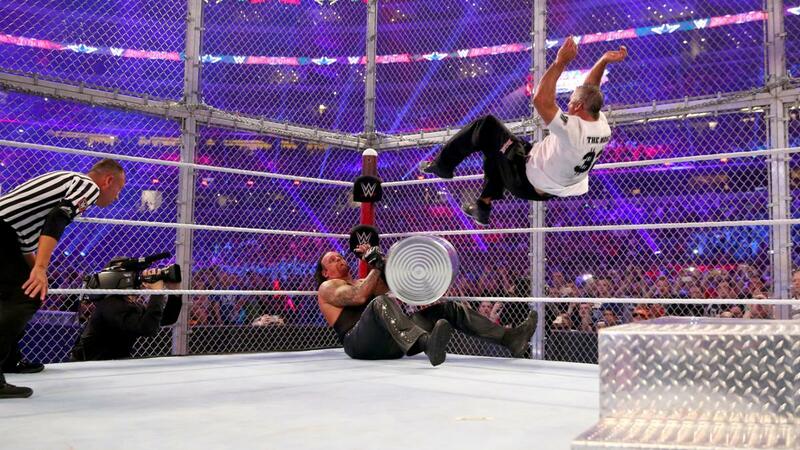 SHANE JUMPED OFF THE CELL! I mean, I think everyone was kind of expecting him to jump off something at something, but I'm not sure anyone was prepared for what it would look like to see a 46 year old man attempt to jump 20+ ft onto a 51 year old bloke and miss. It looked spectacular. A huge moment that long after all the random build has been forgotten people will continue to talk about. 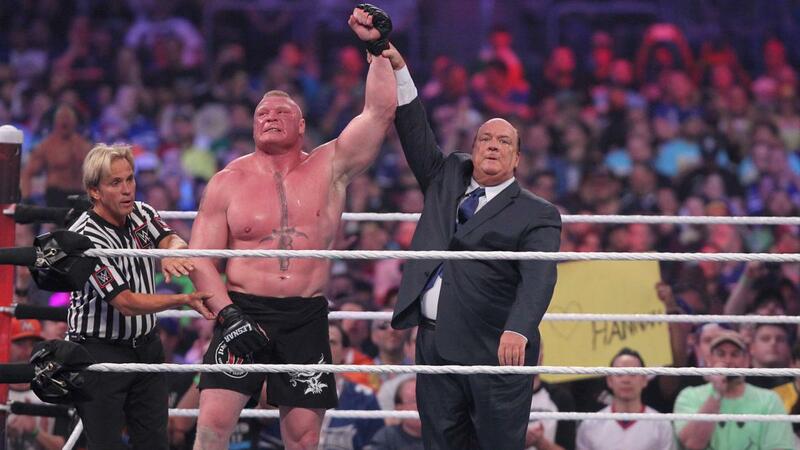 It's a moment that WWE will get plenty of replay value out of for years and years to come. It was a well-produced moment, with their seemingly being some kind of padding underneath the announce table, but it was done so well that I don't think anyone who wasn't looking for something would have seen it. Good job by all involved. There was some lovely stuff heading towards the pinfall here, with the crowd surprising me with the extent of their reaction to little moments like Taker patting Shane on the cheek seconds before delivering a Tombstone Piledriver for the victory. It was for this reason that I felt the finish came across as just a little bit flat again. Wrestling fans have been conditioned over the last few years to think that one Tombstone wouldn't be enough, especially on the biggest stage. Of course, Shane had just crashed from a ridiculous height, but to me it felt like things were building to one last flurry from McMahon, whether that was to come from a kick out or escaping the Tombstone, I would have liked to have seen one last chunk of action before Undertaker got the win. A bizarrely booked match here and no mistake. A couple of nice surprises kicked things off like Diamond Dallas Page and Tatanka's WWE returns in their first matches since January 2015 and 2007 respectively and the crowd seemed pretty hyped to see retired basketball star Shaquille O'Neal. There was some fun moments thrown in here, like the nostalgia pops for Page and Tatanka, and I got a kick out of The Social Outcasts running around the ring in the Bo-Train. However, the overall shape of the bout was a bit of a shambles and the final competitors seemed to have been almost picked out of a hat. The final five came down to Mark Henry (no singles win this year), Bo Dallas (no singles win in over a month), Darren Young (no TV match since February), Kane (no singles win since October 2015) and Baron Corbin (making his first main-roster appearance). 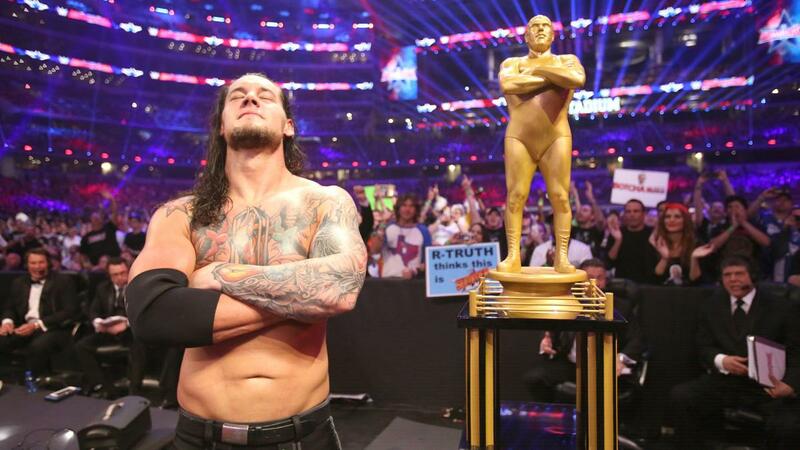 Luckily, WWE took the moment to showcase new talent as Corbin won and got himself a WrestleMania moment, but with a bit more foresight it could have been a more impressive victory. The best thing about The Rock's entrance was that it didn't involve Flo-Rida in any way. Actually that might have been the best thing about the entire show. Any show that doesn't involve a Flo-Rida appearance is surely worth about least a couple of extra points on the ATPW Scale, right? Anyway, less bashing off Flo-Rida (oh er), The Rock's entrance was pretty damn funky wasn't it? He set fire to his own name! Who doesn't love fire? More fire please. I'd like to see everyone set fire to something on the way down to the ring in future. Oh four! I mean five! I mean FIRE! The Rock was there to announce the attendance of the show, but it was all a ruse for the much-anticipated Rock vs. Erick Rowan match that fans have been clambering for for years and years. I actually enjoyed the back and forth between Rock and Bray Wyatt on the microphone, with Wyatt pulling out some lovely turns of phrase that seemingly had the crowd captivated. Rock going down the comedy route worried me just a little, but he was admittedly funny with his replies and also managed to put the Wyatt Family over strong. Rock giving the Wyatt's his endorsement surely sets them up for a babyface run heading out of the show. 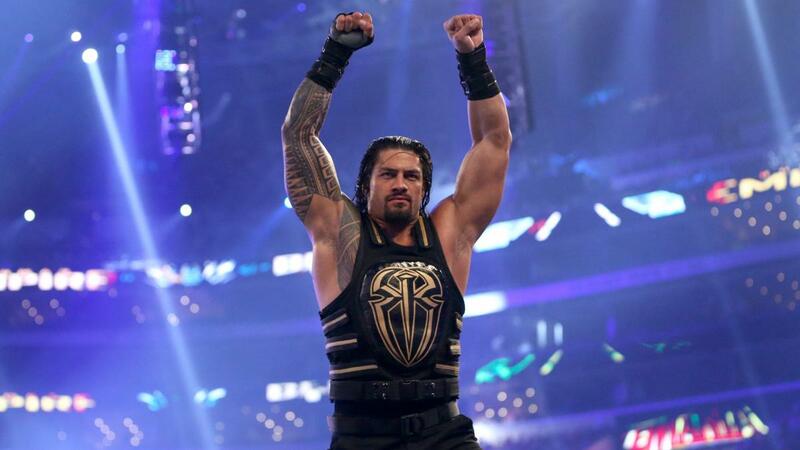 The People's Champ getting the quickest win in WrestleMania history (usurping Kane's ECW Championship win over Chavo Guerrero at WrestleMania XXIV) was also a bit of fun and will hardly hurt Rowan as a performer going forward. I was pleasantly surprised by the pop that 12 time WWE World Heavyweight Champion John Cena received when he came out to save the Rock from the Wyatt Family's post-match attack. The crowd seemed to love this moment and popped for everything that Cena and Rock did on their way to destroying Wyatt Family. Do I think the pair buried Wyatt, Rowan and Braun Strowman? Absolutely not. This moment was bigger than pretty much anything the trio could have done on the show and should actually give them some momentum to produce some strong television over the next few months. Cena and Rock closing the segment by calling back to their WrestleMania XXVIII and XXIX matches was a cool way to close things out. Before I talk about the match itself, I think it's right to point out that this match started a ridiculous time. 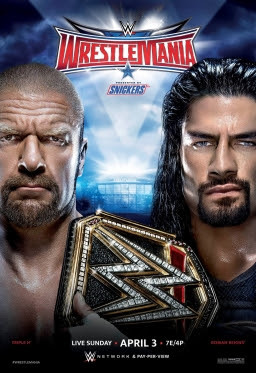 Having Triple H vs. Roman Reigns start over 4 hours into the show will perhaps go down as one of the stupidest booking decision in the history of the WWE. It was a brave decision to put this match on last anyway, with WWE knowing the most vocal and passionate section of their fanbase would be against Reigns winning the title or even just being involved in the title match. A worn out crowd was never going to give this match a chance and that atmosphere cut threw the match and made it even more difficult to get into for the home viewer. Another stupid decision was having the match go for almost half an hour. This was a match that clearly many weren't interested in seeing, so why not put on a short explosive match if you want the bout to go on last? Scrap the five hour show idea, that was surely only done for WWE's vanity and ego and have this bout stripped back to the power moves. Keep things exciting and don't give fans the chance to turn on the bout. The whole exercise was poorly thought through and felt like someone should have spoken up at some point to change the contest. You know what though? There was a lot in this bout that I found to enjoy, which is probably down to the fact that I actually think Roman Reigns is a damn good wrestler. Yes, I agree that WWE should have done something to protect Reigns and switched up their plans either in the six week build to the show or even on the night of the show, but on a personal level I'm pretty cool with Reigns holding the main belt. I thought he performed against the odds in this one, making the most of the poor booking with some strong selling before during and after the match. One of my favourite moments of the contest was made by some brilliant camera works and production as Reigns came seemingly out of nowhere and speared The Game through the barricade. The biggest reaction of the clash was when Triple H dodged a spear and Reigns hit Stephanie McMahon instead. It was a big reaction, which was probably made by WWE rarely showing male on female violence. It did look genuinely destructive to poor old Steph, who is much more over as a heel at the moment than Triple H is! Unfortunately the closing stretch didn't feel like one that should be closing at near 30 minute match that is headlining the biggest event of the year. I liked the idea of Triple H getting the Sledgehammer due to being unable to putting Reigns away and that if he had hit Reigns with it he would have retained his title, but it just ended up feeling more than a little flat when Reigns nailed a spear and picked up the win. In my opinion, this was far from a bad match and I actually did manage to enjoy it, but it was clear to everyone what reaction the match was going to get and WWE should have done more to change this. Having Stephanie cut a weird heel promo on top of a thing was never going to work with the type of fan that was already against the contest, was it? For me, the Women's Triple Threat was the strongest wrestling contest of the evening, whilst The Undertaker and Shane McMahon provided the best of the sports-entertainment style bouts. 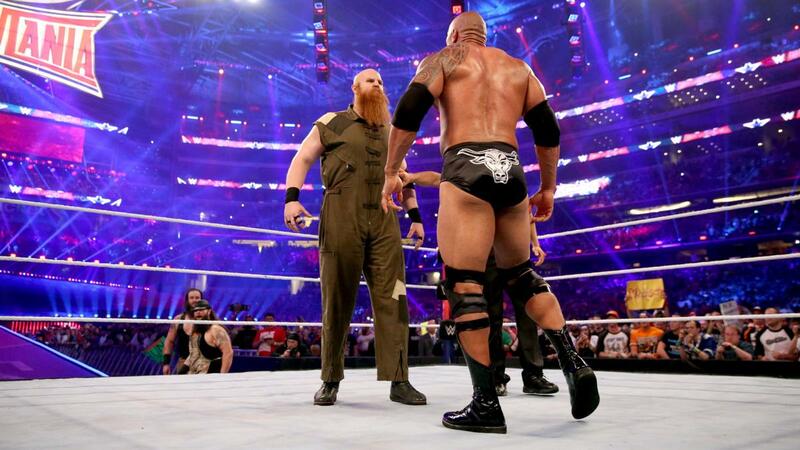 The return of The Rock and John Cena provided some brilliant moments and I'm sure the Wyatt Family will bounce back pretty easily after appearing with two of the biggest names in the history of the industry on the biggest show of all the times. AJ Styles and Chris Jericho could have a good match in their sleep, it's a shame that we never got to see the two face each other in their (and more importantly Jericho's) prime. The main event was what it was, but I'm sure that I enjoyed more than most out there. The undercard was highlighted by a spot-heavy Intercontinental Championship Ladder match and a strong No Holds Barred Street Fight between Brock Lesnar and Dean Ambrose that despite being more than slightly underwhelming still came out as an entertaining clash. This was a strange, strange show. Odd booking decisions, a weird choice of having the event go almost five hours and many moments that left me wondering what the heel I was watching! That being said as a stand alone show I also found myself enjoying the majority of the show, for his spectacular visuals and focus on big memorable moments. Despite it's flaws, I'm more than happy to call this a good show, because quite frankly it was. Especially the first couple of hours.